American Academy of Pediatrics, 9781581109818, 227pp.  Week 2  A Kitchen Revolution: Shaping your child’s taste preferences away from bland, white and processed towards flavorful, robust, and more adventurous by changing the way you purchase, arrange, and prepare foods.  Week 3  The Little Chef: Getting your child into the kitchen  early and often  to encourage him or her to try new foods.  Week 4  A Shopping Adventure: Making grocery shopping and meal planning with your child more of an adventure than a chore.  Week 5  Family Mini-Feast: Recognizing the value of family meals and setting them up to fit your lifestyle while progressing in your pursuit of undoing picky eating.  Week 6  It Takes a Village: Enlisting spouses, partners, grandparents, siblings, and friends to help undo picky eating and influence more adventurous choices.  Post-Picky Eater Project Week  Making It Stick-y: Planning for challenges and barriers, and putting contingency plans into action for lasting impact.  And many more fun and healthy recipes! Written by Natalie Digate Muth, a pediatrician and dietician, and Sally Sampson, cookbook author and founder of ChopChop, a food magazine for kids and their families, The Picky Eater Project addresses both the importance of healthy childhood nutrition and family harmony. It offers tips and troubleshooting, recognizing that it takes planning and perseverance to make behavior changes stick, but that it can happen. 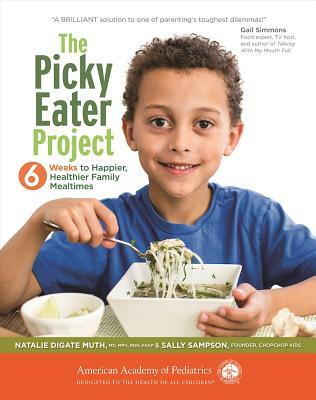 Start your picky eater project today  your kids will love it, and you’ll see real changes in their eating habits! Natalie Digate Muth, MD, MPH, RDN, CSSD, FAAP, is a dual board-certified pediatrician and obesity medicine physician, registered dietitian and board-certified specialist in sports dietetics. She practices general pediatrics with a focus on healthy family routines, nutrition, and physical activity.